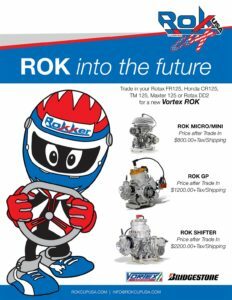 FULL THROTTLE KARTING OPENING SUMMER ROK TRADE IN PROGRAM | Full Throttle Karting! ORANGE, CA (June 13, 2017) – Full Throttle Karting (FTK), working with ROK Cup USA and Vortex Engines, is announcing its 2017 summer season trade in program. Following the same structure as the ROK Cup USA trade in structure, FTK is providing the same opportunity for west coast racers to take advantage and ‘ROK’ into the future.